This Web site is full propriety of company EnerBIM, and respects french act ref. 2004-575 date 21/06/2004 “loi pour la confiance dans l’économie numérique” (LCEN). It constitutes an original protected work under the french “Code de la Propriété Intellectuelle” and outside France under the international conventions and applicable laws regarding copyright. 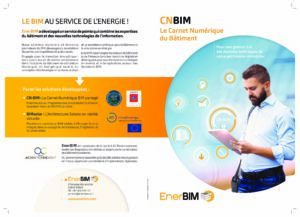 Accordingly to applicable laws, you benefit from access right, modification, rectification and removal of individual-related data, sending your request by registered letter to EnerBIM using the address above. Please note that company EnerBIM takes full necessary action not to communicate those data to third party. Any link to this web site has to be mentioned and explained in a letter sent by email, using our contact form, or by letter using the address above. EnerBIM reserves the right to ask for removal of this link without justification. Informations collected via forms will never be disclosed to any person other than EnerBIM team members. Some of these informations are facultatives, others mandatory, and clearly indicated as such to enable your answers to be sufficient for our use. Accordingly to french act dated 6 January 1978 related to data processing, files and freedom, we inform you that you are granted of a right of access, modification, rectification and removal of individual-related data. © EnerBIM – All rights reserved – Reproduction in whole or in part without written permission is prohibited.